C.Proppé Artist's Blog: In the Studio Today... The Show is On! My first solo show at the Two Bird Cafe is now up and ready to view. I had breakfast there this morning with my amazingly supportive parents, who both helped me this week; Mom with twin sitting and Dad actually learned with me how to hang paintings with fishing wire. Unfortunately, they had to fly home today and will not be here for the opening reception, but they were able to see my paintings in the "gallery", and this was wonderful. Thank you also to my partner, Brian Costello, for helping me move paintings from the Coffee Roasters, and bearing with my stress this week. I could not even attempt to do what I have done with out Brian's support. Thank you also to BJ and Bob Snyder, my patrons who discovered and supported me since my first local painting of the San Anselmo Cyclists at the Roasters in 2005. They are both wonderful and caring artists and art supporters who are always willing to listen and give advice. 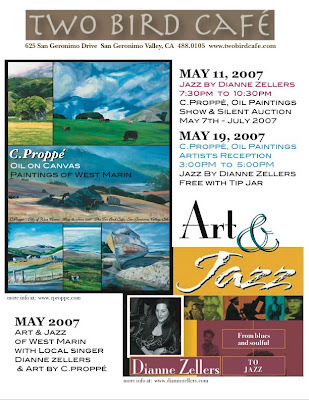 Thank you to Bryan Stubblefield and Ed Wall of the Marin Coffee Roasters, for always agreeing to hang my paintings over the last 2 years, and giving me a bit of graphic design work to boot! Thank you to Kate Peper, Christina Johnson and Michelle Shelfer, my oldest Marin friends and artists too, who have all been great emmotional support as I proceeded to put this show together. Thank you to Judith Selby Lang, Barbara Lawrence, Michael Feldman and Timothy Horn, who have given me art advice during this year. Thank you to Jazz Singer, Dianne Zellers, for agreeing to sing at my reception! And finally, thank you to the Two Bird Cafe for hosting my work and the upcoming reception. I look forward to seeing you all on May 19th, at 3pm!